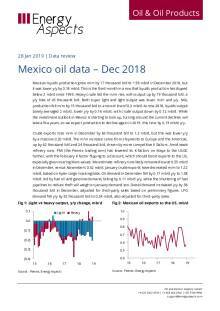 Mexican liquids production grew m/m by 17 thousand b/d to 1.93 mb/d in December 2018, but it was lower y/y by 0.18 mb/d. This is the third month in a row that liquids production has dipped below 2 mb/d since 1995. Heavy crude led the m/m rise, with output up by 19 thousand b/d, a y/y hike of 45 thousand b/d. Both super light and light output was lower m/m and y/y. 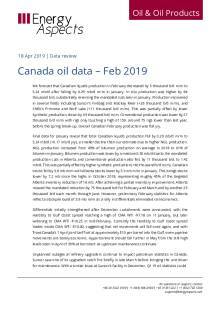 NGL production fell m/m by 15 thousand b/d to a record low of 0.2 mb/d. Across 2018, liquids output barely averaged 2 mb/d, lower y/y by 0.16 mb/d, with crude output down by 0.12 mb/d. While the investment outlook in Mexico is starting to look up, turning around the current declines will take a few years, so we expect production to decline again in 2019, this time by 0.13 mb/d y/y. Crude exports rose m/m in December by 63 thousand b/d to 1.2 mb/d, but this was lower y/y by a massive 0.20 mb/d. The m/m increase came from shipments to Europe and the Americas, up by 62 thousand b/d and 24 thousand b/d, driven by more competitive K factors. Amid weak refinery runs, PMI (the Pemex trading arm) has lowered its K-factors on Maya to the USGC further, with the February K factor flipping to a discount, which should boost exports to the US, especially given soaring Mars values. We estimate refinery runs likely remained low at 0.55 mb/d in December, versus November’s 0.52 mb/d. January crude exports have decreased m/m to 1.22 mb/d, based on Kpler cargo-tracking data. Oil demand in December fell by 0.17 mb/d y/y to 1.58 mb/d, led by fuel oil and gasoline demand, falling by 0.11 mb/d y/y, while the shuttering of fuel pipelines to reduce theft will weigh on January demand too. Diesel demand increased y/y by 58 thousand b/d in December, adjusted for third-party sales based on preliminary figures. LPG demand fell y/y by 92 thousand b/d to 0.24 mb/d, also adjusted for third-party sales.